Did You Adopt a Cat Over Christmas? 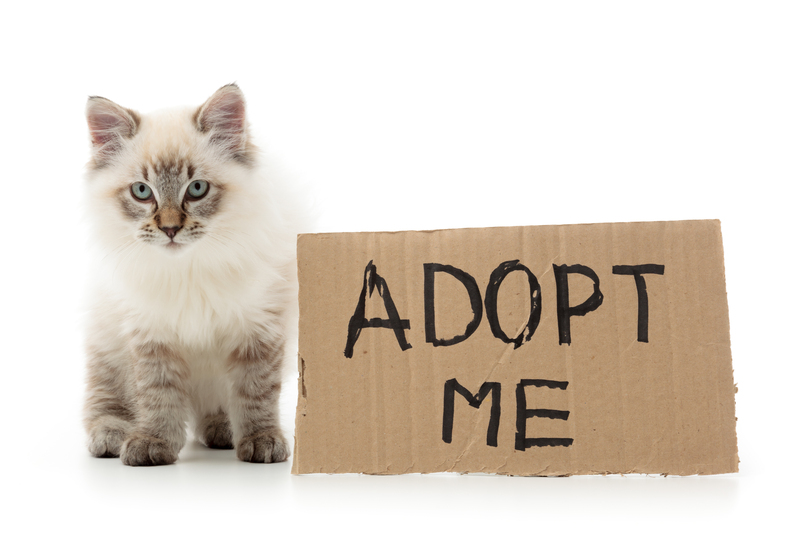 If you are ready to adopt a cat or recently adopted a cat we bet you know cat adoption is rewarding, fun and life saving. Congratulations on bringing that kitty home with you! Here are some tips to get everything off to a great start. Socialization First of all recognize that cats do like human companionship. Although they like to hunt alone they are not the solitary creatures we once envisioned them to be. Be sure to take time to teach your cat to play and interact with you. Pam Johnson-Bennett offers great advice in her book CatWise regarding socializing with other cats, with dogs and with humans. Declawing If your new family member has not been declawed we urge you to forego that procedure. Declawing is the amputation of the first joint of all the cats’ digits and is extremely painful. Some cats suffer tenderness in their paws forever. If your cat has been declawed, please don’t let him outside. He can no longer protect himself without claws. Scratching So what to do to protect your furniture from being shredded after you adopt a cat? Recognize that cats scratch to get good shoulder stretches, when excited about something pleasant and to displace tension. Purchase or make a sisal covered scratching post. Make sure the scratching post is tall enough for your cat to fully stretch his shoulders. You may find it helpful to place the post near the corner of a sofa so it’s handy for your kitty. There are also scratching pads that hang from a doorknob and corrugated cardboard scratching pads that sit horizontally on the floor. Litter Boxes If you live in a multi-level home be sure to have at least one litter box on each level. It’s also a good idea to have one more litter box than you have cats. Recognize that cats are fastidious creatures and don’t like to use dirty litter boxes. It’s ideal to scoop the litter two times a day, but please scoop at least one time each day. Remember that cats’ noses are sensitive so unscented litter is the best idea. Exercise and Nutrition A fat cat is not healthy so give your cat opportunities for exercise. Did you know you can even clicker train your cat to walk in a kitty harness on a leash? 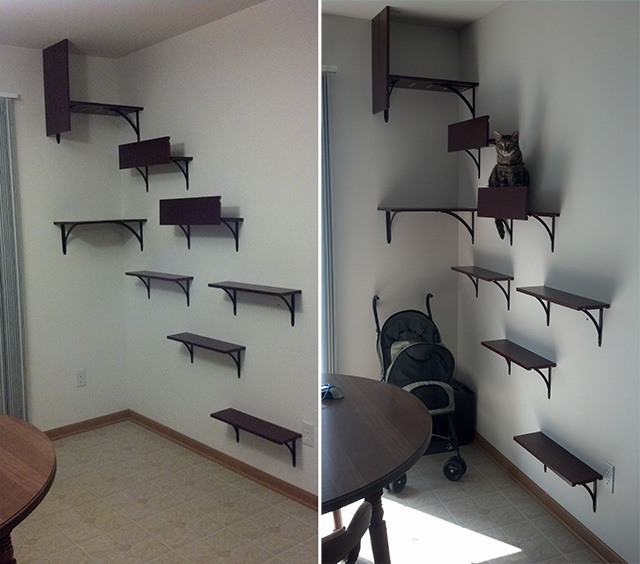 Think vertically so your cat has places to climb and to feel safe. Jackson Galaxy in his book Catification offers lots of innovative solutions. 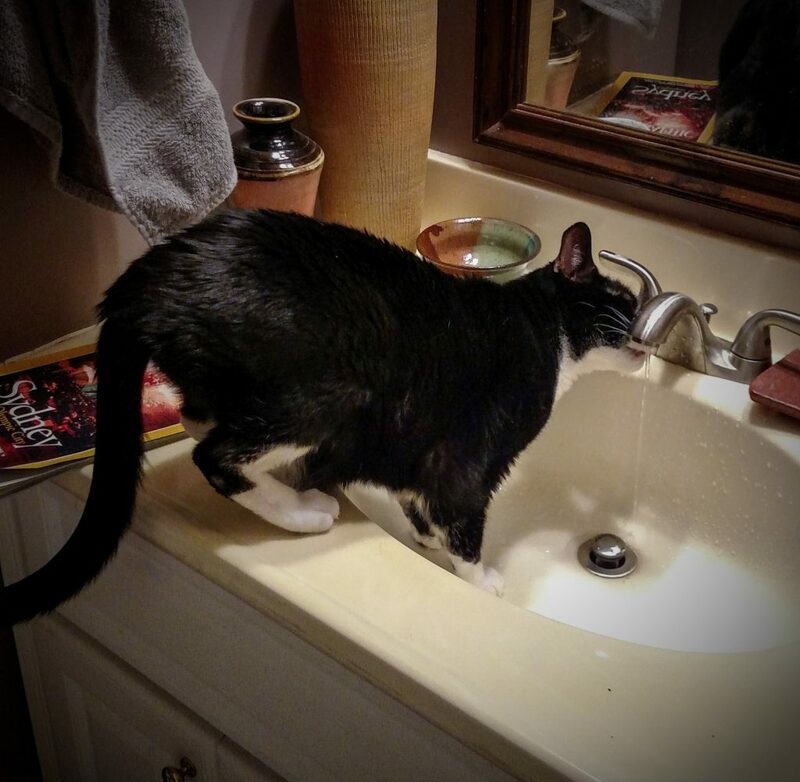 Arden Moore writing in her book Fit Cat reminds us that cats need encouragement to remain hydrated. Bubbling water fountains encourage cats to drink water. 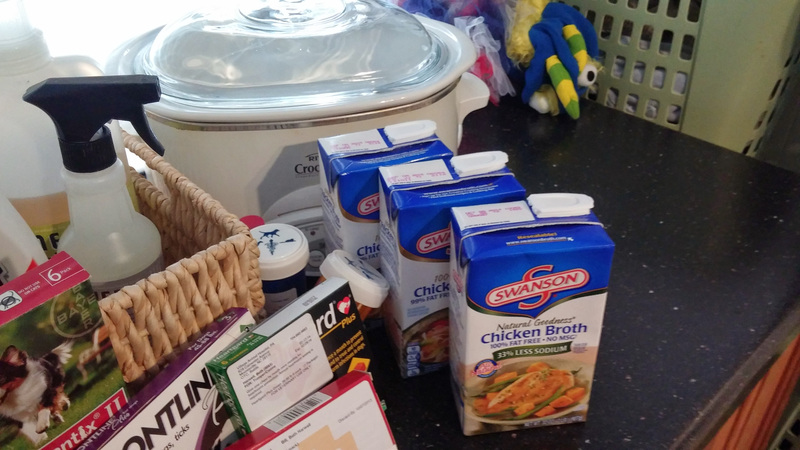 Canned food or sodium free broth added to kibble will encourage cats to get greater water intake. Cats are obligate carnivores so need protein from chicken, beef, lamb, salmon, turkey or tuna. Avoid meat or poultry by-products. Indoor Happiness In addition to vertical spaces and scratching posts, consider adding a kitty garden and toys to your cats’ space. 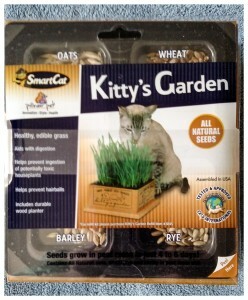 There are multiple options available but we like SmartCat Kitty’s Garden. Toys run the gamut from crinkled foil and cardboard boxes to tunnels and feather wand toys and laser pointers. Allow your cat to “catch” the prey to provide satisfaction. Remember to provide a variety of kitty beds and leave her carrier out. If she can go in and out of her carrier at will she will be less likely to hide when it’s time to visit the vet. Veterinary Care Cats need routine veterinary care for a variety of reasons. Your cat can live a long healthy comfortable and happy life with regular check ups, necessary vaccinations, and dental cleanings. It’s a lot less expensive to be proactive than reactive too. Pet Sitting When you initially adopt a cat it’s best to let your cat become accustomed to her new environment and comfortable in her surroundings. Try not to travel too soon after you bring your new kitty home. But eventually we know you will need to travel for business or pleasure. We recommend you hire a professional pet sitter so your cat can stay in the comfort of home. We offer cat sitting in your home. Our service area includes all of Mooresville 28115 and parts of Mooresville 28117, parts of Mt. Ulla, Davidson and parts of Cornelius. If you reside out of our service area check out the pet sitter locators in Pet Sitters International and National Association of Professional Pet Sitters. If you are ready to add a cat to your family please choose adoption. If you live in the Lake Norman area we recommend the following places to find sweet and needy cats. Are You Ready to Adopt a Shelter Cat? The term “cats gone wild” conjures up all sorts of images. Maybe you picture a cat attacking a person or dog. Maybe you picture a cat knocking all the soap and shampoo bottles into the bath tub. Maybe you picture a cat knocking other cats down the steps. Maybe you picture a cat resisting your efforts to give it a pill. Our story of cats gone wild is much more mundane. Several weeks ago I was on a pet sitting visit with Angelo, one of the cats we take care of on a regular basis. Angelo had gone upstairs and I was downstairs writing my note for his humans. Suddenly I heard a crashing sound. Fearing the worst, I went upstairs and discovered he had knocked over a picture frame on the edge of a table. I moved all the photos to the other end of the table and hoped for the best. That incident reminded me of another time when Toby, another one of our cat clients was chasing his sisters through the house. He leaped on the kitchen island and knocked over a beautiful glass figurine. It shattered into what seemed like a million pieces. I picked them all up (with broom and then damp paper towels) and carefully inspected all the cats to make sure no one got cut. Both these incidents made me think about solutions to prevent cats from knocking things over, particularly things that break. After a little research I found an article in cathealth.com. 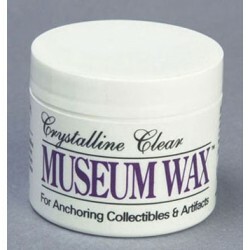 The solution..tada….museum putty or museum wax! Brilliant!! 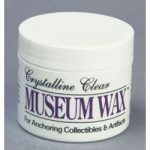 You can buy museum wax or museum putty at stores like Home Depot, Lowes, Ace Hardware and crafts stores. There are numerous brand names. In addition to holding ceramic and other breakable items in place you can use it to secure a picture frame to the wall. Museum wax will not only keep your breakables safe from your cats, it will keep them safe from your small children and clumsy adults. It’s a win-win-win situation. We love to look at pet designated days, weeks and months. Earlier this month we noticed that January 22 is National Answer Your Cat’s Question Day. The day is designed to remind us to pay attention to what our cats are trying to tell us in the only language they have. Rather than simply being annoyed when your cat pees outside the litter box, scratches your sofa or meows incessantly, you are encouraged to think about the issue from your cat’s perspective. With thoughts about what your cats might ask we offer 6 facts your cat wants you to know about kitty litter boxes. Fact # 1 About Kitty Litter Boxes: Cats prefer their litter boxes to be located in quiet places. Unfortunately, many cat owners place the kitty litter boxes in the laundry room which is extremely noisy when the washer goes into spin. Add to that the sound of the dryer when the dryness sensor goes off. And just imagine what happens if the washer goes out of balance just when your cat is using the litter box! Those scary noises can negatively impact your cat’s willingness to use his litter box. Fact # 2 About Kitty Litter Boxes: Cats don’t like scented kitty litter. Their noses are extremely sensitive and your cat may find the aroma you like quite distasteful. There’s another reason for your cat to avoid the litter box. Nobody wants that. Fact # 3 About Kitty Litter Boxes: Cats like clean litter boxes. Think about how you feel if you go to use the toilet and there’s “stuff” in it. Cats with their keen sense of smell are easily put off by the odors from the litter box. It’s best to scoop the litter box after every use, but that may not be practical. However; it’s pretty easy to get on a daily or twice daily litter scooping schedule. Your cat’s nose as well as your own will appreciate the effort. 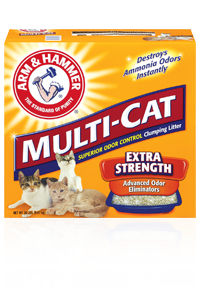 Fact # 4 About Kitty Litter Boxes: The standard to strive for is one litter box per cat + 1. If your house has multiple levels, please put at least one litter box on each level of your house. How would you feel if you had to run from the second floor all the way to the basement every time you needed to go potty??? By having multiple litter boxes each cat can choose his or her favorite “bathroom.” If some of your cats prefer different types of litter you can easily use the preferred kind in that cat’s preferred litter box location. The same thing regarding covered or uncovered litter boxes is true. It will probably take some experimentation to find the just right combo. But it’s so worth it to keep a beloved family member happy for his 15 – 20 years of life. 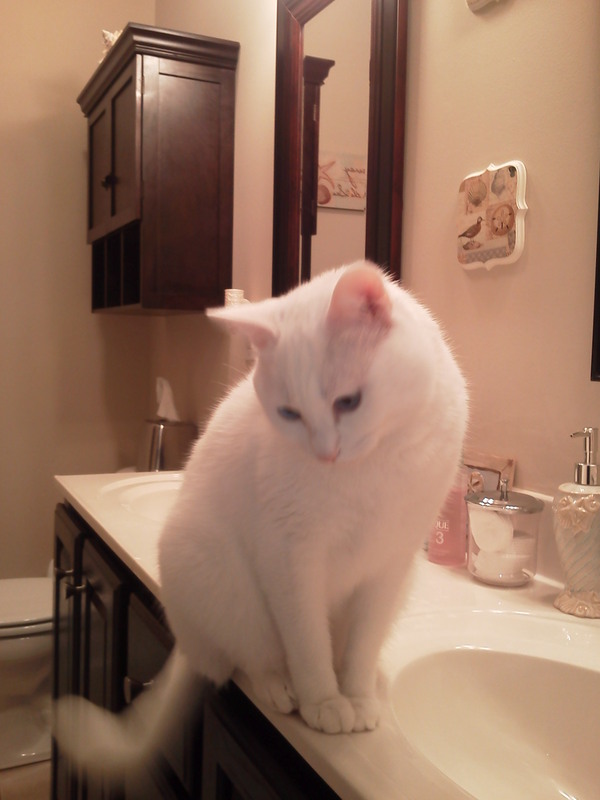 Fact # 5 About Kitty Litter Boxes: Cats don’t like eating in their bathrooms. Just imagine how you would feel if your dining table was next to your toilet! Not particularly appetizing is it? It’s best to locate your cat’s food and water bowls in or near the kitchen and to place their litter boxes in the bathroom or in open door closets in quiet low traffic bedrooms or perhaps even in your home office. Fact # 6 About Kitty Litter Boxes: Sometimes kitty litter box issues are indicators of medical problems. And…these medical problems can be life threathening particularly when it involves a urinary track blockage in make cats. Read the blog by our friend and colleauge Rita Reimers the Cat Analyst regarding a cat with a urinary tract blockage. 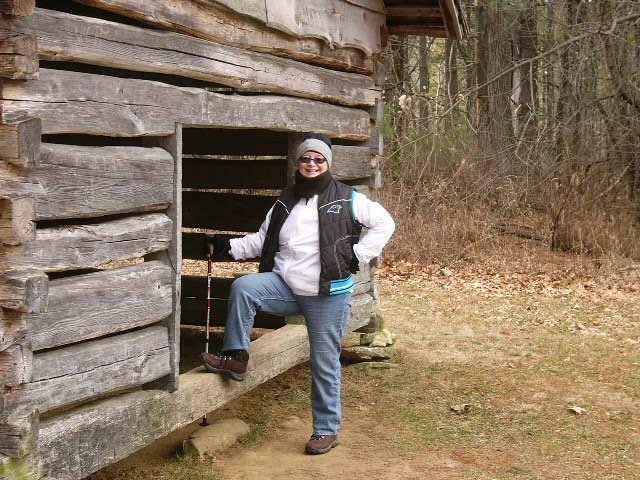 Rita is a trusted colleague who also offers cat sitting services in the Charlotte area. 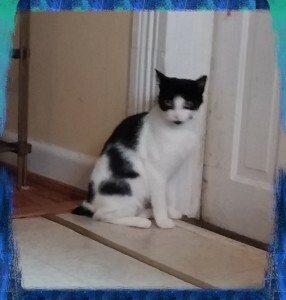 When you next need kitty sitting services call us at 704-662-0973. We provide kitty care services for residents in Mooresville, Cornelius, Davidson and Mt Ulla, NC who live within 8 miles of our home base. Check out our kitty sitting page to learn more. Pet owners post pictures and pleas for help about their lost pets on social media on a daily basis. It’s always heartbreaking to read. There’s nothing like a little prevention to avoid the heartbreak and to keep your pet from getting lost. Just in case the unthinkable does happen, please get your pet micro chipped and place a collar with ID on your pet. 1. Keep your cats indoors unless you are actively supervising their time outdoors. 2. If your cats enjoy the fresh air, consider building a catio for them. 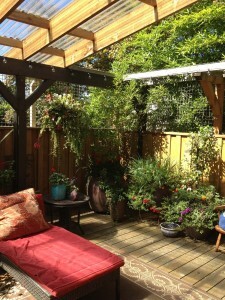 The catio can be a very simple structure or more elaborate. 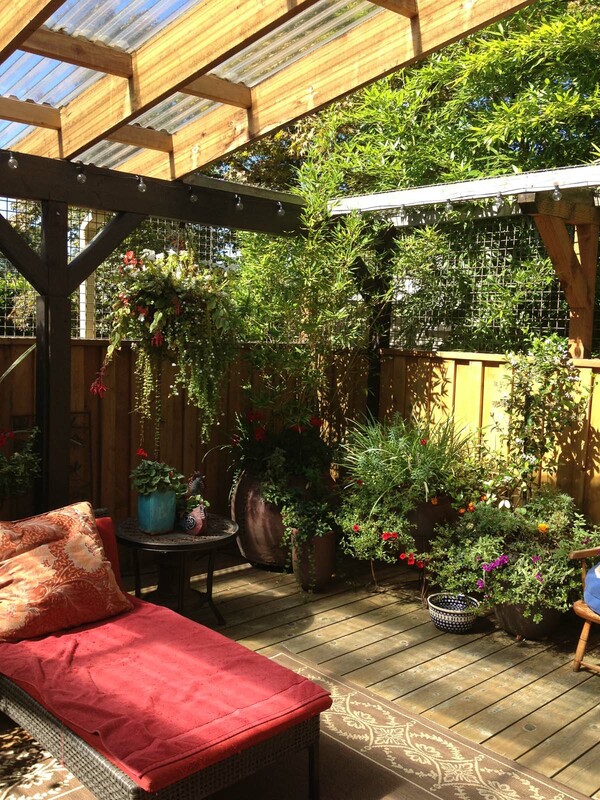 The catio pictured to the right was featured in Landscape Design in a Day. Animal Planet provides plans for the DIY tribe. 3. When entering and exiting your home, do so carefully. If you enter via the garage, be sure the garage door is shut completely before entering the main part of the house. 4. When someone else is pet sitting for you remember that your cat is not as likely to come to them as they are to come to you. So ask your pet sitter to keep your cat inside. 5. If your dog has a fenced in yard, check the perimeter of the fence on a weekly basis to make sure there are no gaps or breaks in the fence. Always check your fence after extreme weather too. 6. Check the latches on the gates on the same schedule. 7. Supervise your dog while she is outside even if you do have a secure fence. 8. 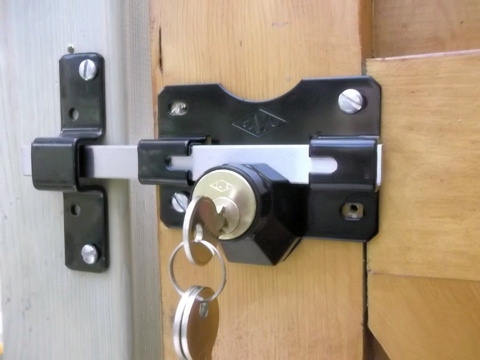 Consider adding a lock on your gate so that any workers (utility, landscape, pesticide etc) need to check with you to gain access. 9. When walking your dog always use a leash that is 4 to 6 feet long. Attach the leash to a harness or head collar that attaches under the chin. 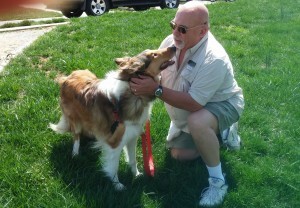 Please see the Doggy Care page of our website for recommendations. NEVER use a retractable leash….. they are NOT safe. 10. If your dog uses a doggy door close it when you are asleep or away from home. 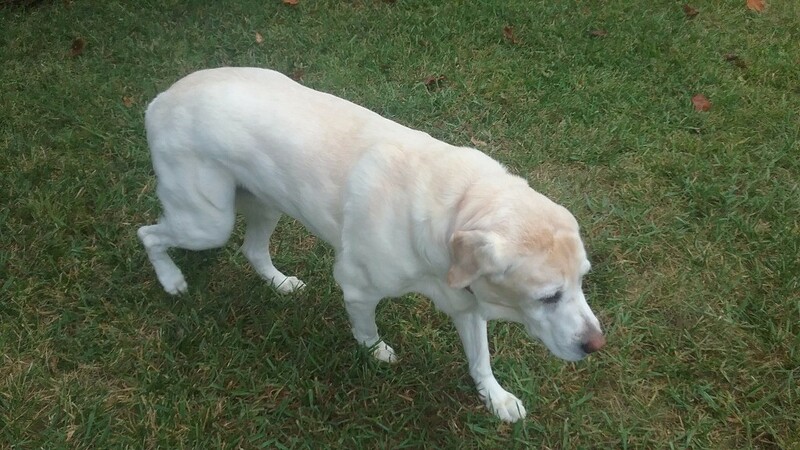 When someone pet sits your dogs, leave the doggy door closed. Remember that in addition to pets going missing on their own, people do steal dogs, particularly if they are unsupervised. 11. When your cat or dog is riding in your vehicle, make sure they are in a carrier or crate or harnessed in. Although studies have not indicated such devices protect your pet in a serious crash, they will keep your pet from jumping out a broken window or door. Also, unrestrained pets create a distraction that can lead to an accident. Prevention is always the best action. 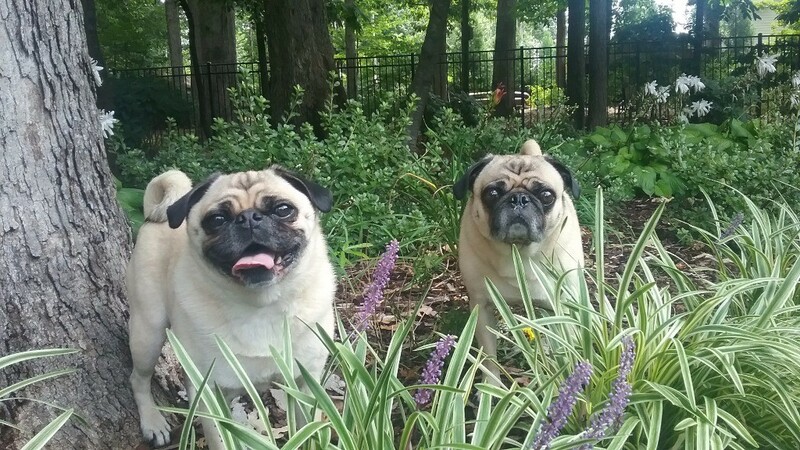 Watch for our post coming soon where we share awesome tips to find a lost pet. As a segue, we remind you to get your pet micro-chipped. 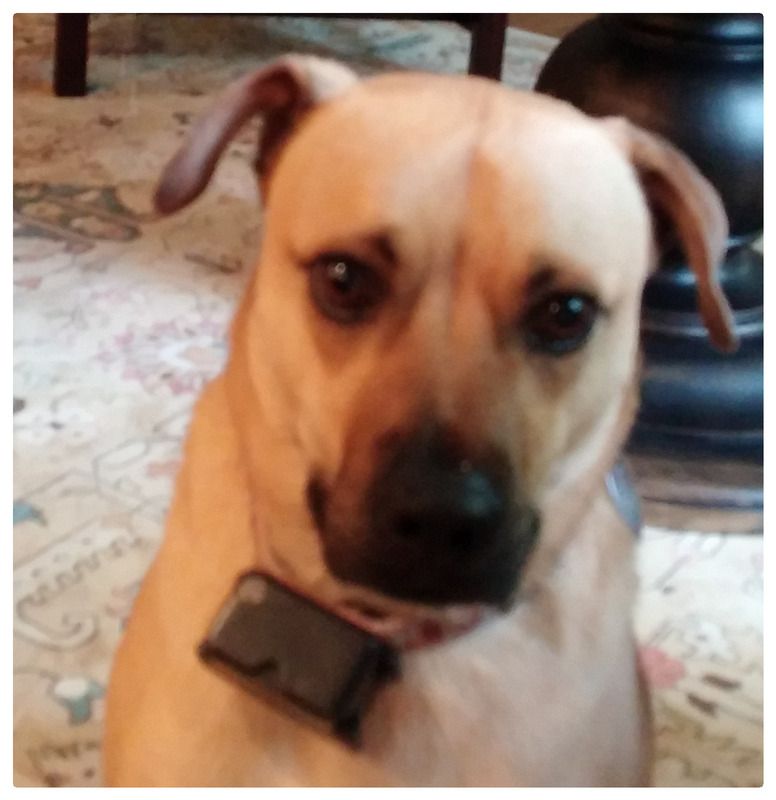 Your pet should wear a collar with ID when you leave the home with your pet. There is divided opinion regarding whether it is safe for your pet to wear a collar when at home, so you decide on that one. Is a Dog Door Right for Your Home? keeps you awake all night. If that sounds familar or you simply want to avoid those woes, read on. Plan ahead. Bringing home a new family member is very important. It requires some thinking ahead and should not be an impulse decision. We all know what happens when we look into those big brown puppy eyes and just melt. Once you meet the puppy it is next to impossible to leave him behind. Decide if your current lifestyle can accomodate the needs of a puppy. 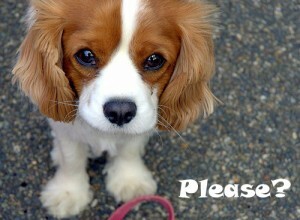 If not, consider adopting a slightly older dog or postpone your dog parent days until later. Decide what size and breed puppy you want. Do you have your heart set on a specific breed? 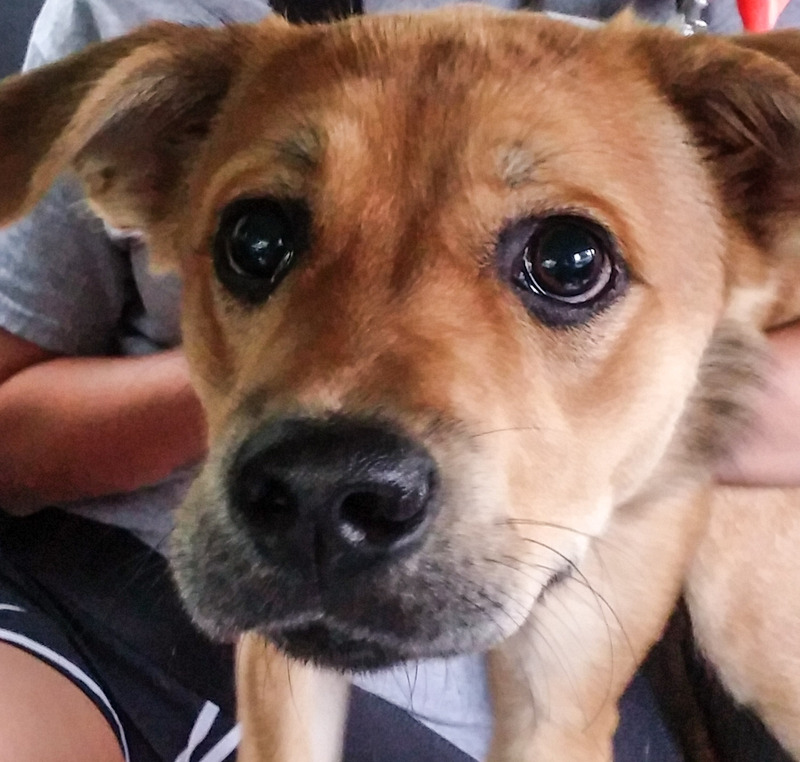 Do you want to adopt a mixed breed dog? What activities do you want to do with your dog? If you want a dog to take on hikes a Chihuahua is probably not the right dog for you. If you want a lap dog, it’s best not to choose a German Shepherd. What about shedding? Do you or your family members have allergies? These are all important considerations when choosing the right type, size, temperment and breed of dog for your household. Dog Time provides an easy and short survey to get you started on the process. Just for fun I took the survey. 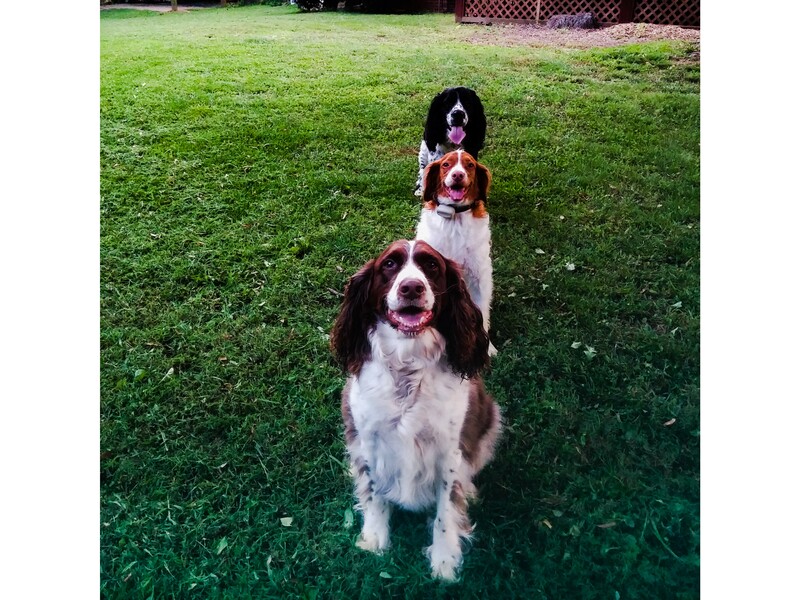 The closest match I got to the dogs that own us was the English Cocker Spaniel. We have a Brittany and two English Springer Spaniels. But it got me thinking about my preferred characteristics in dogs for my later years when my lifestyle changes. Prepare your home and yard. Now that you have decided on the right type, size, temperment and breed dog you want, prepare your home and yard for the new puppy. Take a good look around and think sort of like a new human parent. Pick up all the clutter that is laying around. You don’t want to have to replace cherished items and certainly don’t want your puppy eating something dangerous to her. Will you need to install puppy gates on some doors? What rooms have tile or hardwood floors? That’s important when considering puppy ah, er, eh…elimination! Where is the best place for dog beds and crates? What kind of toys will your puppy need? Where will you feed your puppy? 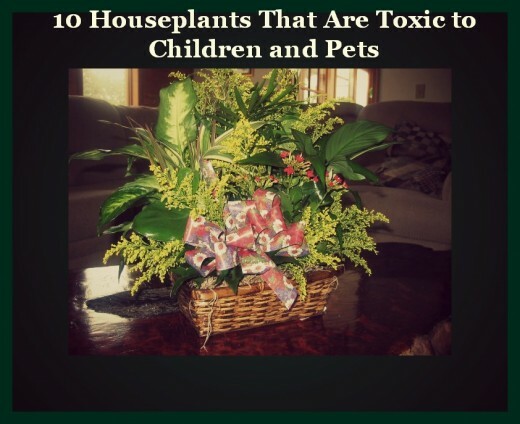 Does your yard contain plants that are dangerous to dogs? Is your yard fenced or will you need to always take your dog out on leash? Learn how to house train your new puppy before you bring him home. This tip applies to any age dog that you adopt. Even if the dog was previously trained, he has to learn the boundaries in your home. Remember that puppy bladders are small and that they have to not only develop physical control but also learn where it is ok to go potty. Depending on the size puppy, previous history and environmental conditions it takes between 4 months and a year to fully potty train a new puppy. You can begin the process around 12 weeks of age when your puppy has developed bladder and bowel control. Dog Care Knowledge offers great suggestions on how to house train your new puppy. Remember to take your puppy out after every nap, after he plays, after he eats, just before bedtime and as soon as he wakes in the morning. If you are using a crate, the maximum length of time your 2 months old puppy can “hold it” is 2 hours; at 3 months he can “hold it” for a maximum of 3 hours and at 4 months he can “hold it” for a maximum of 4 hours. The Housebreaking Bible has a nifty housetraining schedule you may want to adapt. Research what kind of food to feed your growing puppy. It seems there are a million choices of nutritional plans to adapt for your new four legged family member. You can feed your growing puppy homemade food, frozen raw food, canned dog food or manufactured kibble. A good rule of thumb is to use the best food you can afford. Opinions vary on what is best but for the most part we know the least expensive brands of kibble contain a lot of fillers. Those extra fillers create a lot of waste which you will see in your dog’s poop. You will most likely have to feed more of the lower quality foods so will not save as much money as you might anticipate. Be sure to remember that a highger quality diet will result in fewer illnesses for your dog and thus less costly vet bills. A great place to research and compare dog foods is the Dog Food Advisor. A tired dog is a happy dog and a good dog. It’s unrealistic to expect a puppy to occupy himself all day while you commute to and from work, take a lunch hour and actually work 8 hours. And remember our notes above on how long a puppy can “hold it.” So know ahead of time you will need to share the “letting out” tasks with someone. Perhaps you can take an early lunch time and someone else in the household can take a later lunch time so you can both come home to take the puppy out. Maybe you can staggger your work hours to accomplish those same tasks. If you have a reliable neighbor that’s another idea. Pet sitters and dog walkers offer their services so you may want to research the Pet Sitter Locaters offered by Pet Sitters International or the National Association of Professional Pet Sitters. Choosing a professsional who is reliable, trustworthy, bonded and insured will likely save you money in the long run. Most pet sitters offer a variety of services including daily dog walks and vacation pet sitting services. 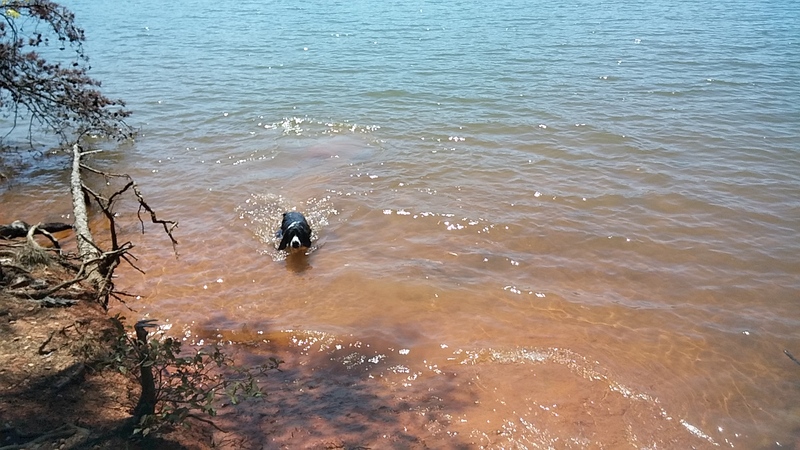 What starts as a puppy potty break may very well grown into a daily dog walk and vacation pet sitting servivces too. Patricia McConnell, noted applied animal beaviorist offers her opionion on hiring a dog walker. We liked her article and commented on her blog post discussing our services. If your puppy is to be an only dog you may also want to consider taking her to doggy day care one or two days per week to assure she has good socialization skills with other dogs. Patricia McConnell, offers an excellent view regarding how to evaluate if your dog is suited for a doggy day care and how to find the right doggy day care. No matter what choice you make, assure that the person or people taking care of your dog are meeting her physical needs for a potty break and a snack, getting some exercise and enjoying some one on one brushing, stroking or play time. Be sure the care giver is familar with dog body language, is mature and responsible, reliable and capabe of using good judgement. Pet first aid and CPR training is a must too. It’s important that any one who takes care of your dog shares your philosophy on how to treat your dog. We prefer positive based training and interactions and are very clear with prospective clients about our methods. 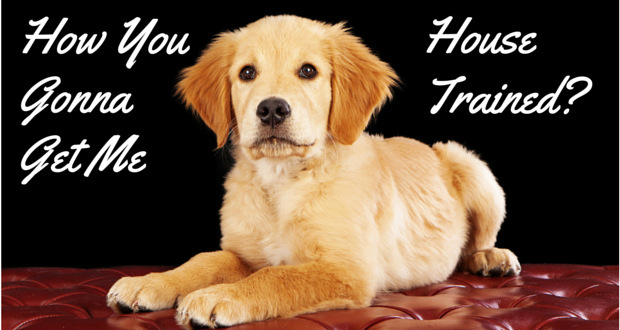 Who will teach you to train your dog? That’s right, we said who will teach you now to train your dog, not who will train your dog. 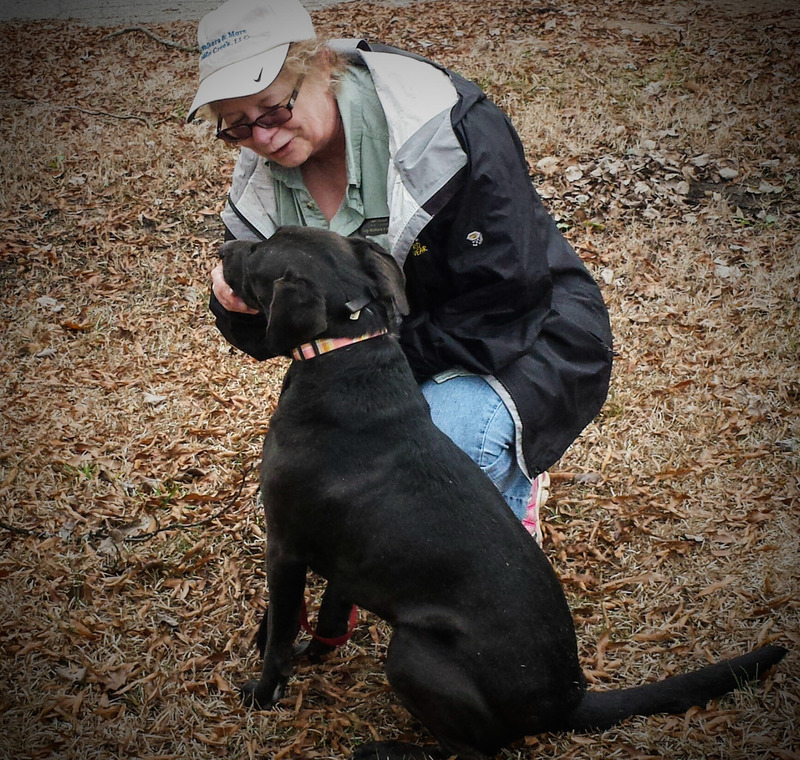 It’s your responsibility to do the training and oh so rewarding when you see your bond deepen as your dog learns to trust you. Training is best done in tiny little “bites” of five minutes or so multiple times during the day. Incorporating training into play time and meal time and bed time and all the “times” works great to have a positive dog-human bond. While we don’t advocate board and train schools, we do recommend that you participate in at least a puppy class with your new puppy and in a family companion type class as your puppy gets older or if you have adopted an older dog. 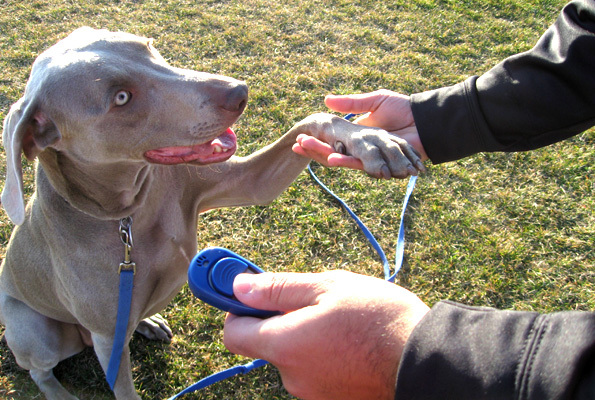 The Association for Force-Free Pet Professionals offers a directory of trainers who use postive reinforcement methods. An excellent resource for finding a good dog trainer is the Certification Council for Professional Dog Trainers. Note that you will need to research if these professionals use force free methods only or also incorporate other methods in their training. We heartily endorse clicker training. Now go out there and enjoy the next decade or more with your new family member!! In mid April I had the pleasure of traveling to Atlanta to attend a two day conference of the Cat Division of the International Association of Animal Behavior Consultants (IAABC). Presenters provided information on a wide range of topics including cat nutrition, successful dog – cat interactions, handling aggressive cats, social organization and communication in the cat, compulsive grooming issues, understanding medications veterinarians prescribe and using humane handling and behavior therapy to reduce stress among cats in shelters. In a nutshell, attendees learned about meeting the needs of your cats. Steve Dale, who delivered the keynote address reminded us that there are more cats in US households than dogs, yet their needs are often overlooked. More cats are given up to shelters than dogs, yet fewer are adopted from the shelters. The most often cited reason for giving up a cat is behavior issues including litter box issues and negative behavior between the cats in a household. For a long time we humans have believed that cats are independent and non social. This is just not true. We need to learn to watch for the more subtle cues cats give off when they want to interact and just how they interact. It’s important for cats of all ages to have toys to play with and to have your home arranged in a welcoming manner for cats. No, you don’t have to do over your entire home, but consider putting a cat tower in a room, a couple of scratching posts near the furniture you want to protect and some tunnel like areas for your cat to use to satisfy his hunting instinct. When was the last time you took your cat to the vet? Feeling a little uncomfortable with that question? If you are among the very many cat owners who dread the thoughts of taking your cat to the vet, start thinking like a cat. Instead of only bringing out her carrier when you are going to the vet, leave it out and open so it becomes a part of her every day life. If your cat likes treats, toss a few in the carrier from time to time. If your cat is stimulated by catnip, place a catnip infused toy inside his carrier. A trip to the vet will be much easier if you and your cat are not traumatized by the actions necessary to just get in the car. You might also want to consider using a veterinarian who specializes in the care of cats. 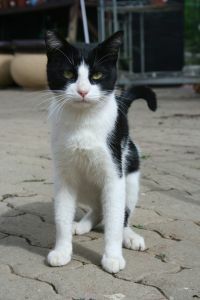 If you don’t have a nearby cat specialist, consider using a vet that has a separate entrance and waiting area for cats. All of these steps can ease the stress on you and your cat and go a long way in meeting the needs of your cats. Neither Billy nor I have ever lived with a cat, so admittedly we had a great deal to learn when we opened our pet sitting business. That is the main reason I attended the cat behavior conference last April. As we have cared for cats, I have grown increasingly fond of them and have learned a great deal about their needs. It was time to expand my education and I thoroughly enjoyed doing so. In addition to continuing education I enjoyed the company of 4 other pet sitters that I regularly “talk with” on line. We were all interested in learning as much as we can. These pet sitters know and understand cats and in Rita Reimers’ case, specialize in providing care only for cats. Rita is also known as The Cat Analyst and offers cat behavior consultations so look her up if you are experiencing behavior issues with your cat. Want to Know More about Meeting the Needs of Your Cats? The IABBC posts a blog that many of you may find helpful. We also recommend the related articles referenced below. Happy cat reading! Ever Wonder If Cats Talk To Each Other? We will be hiring two part time employees in the near future. Currently we are developing the employee handbook, dotting i’s and crossing t’s and generally setting up the legal structure to hire the right employees to help us take care of your pets. Do you realize that Valentine’s Day is on a weekend this year? Yes indeed, so it’s the perfect time to celebrate with the one you love and get away from your day to day activities for a mini vacation. Folks who live in Mooresville, Cornelius or Davidson have great proximity to the mountains for a wine tasting tour or something a bit more eclectic. We’ve got some recommendations too. What’s that you say? You would love to, but what about the dogs, cats, birds and hamsters? Not to worry. Give us a call and we can set up a free consultation to meet you and your pets and get prepared to look after them while you’re gone. Now, what to do about the human kids…..sorry, we’ve got nothing for you!! A few years ago Billy and I visited Shelton Vineyards and had a great time. We happened to go during the time of year that we could take a tour of the vineyards, but the best part was the wine tasting, so who cares if it’s too cold to tour the vineyards? They are offering a special Cupid’s Package for Valentine’s Day weekend that is sure to please. When we last attended a wine tasting at Shelton Vineyards, the hotel was under construction but it has been open for several years now. Located in Dobson, NC the trip from Mooresville is only 64 miles so you can easily get there in just a little over an hour. If hotels are not your style there are bed and breakfast options available in the area. You better hurry though because those quaint lodgings are nearly all booked already. Stony Knoll Vineyards offers a special Valentine’s Day wine tasting. They even have a sweet little cabin wine lodge. Want Something a Little Different for Valentine’s Day Weekend? 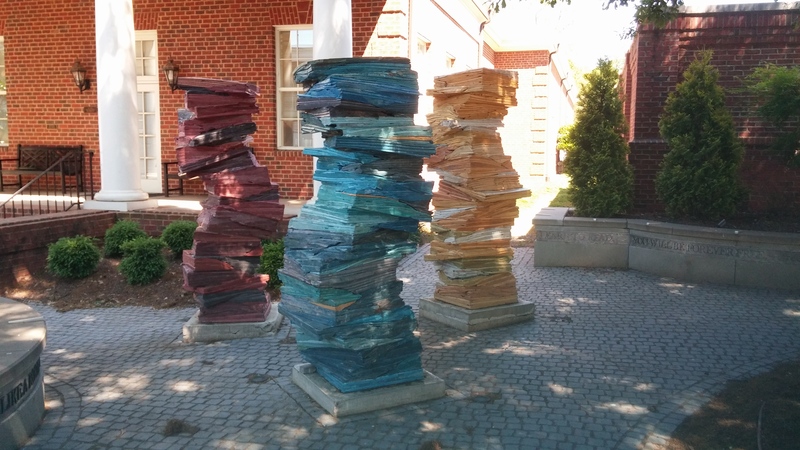 Odyssey Center for Ceramic Arts offers an opportunity to get dirty. LaZoom Tours offers a funny twist on city tours. The Let Your Love Roll Ride departs from the Asheville Brewing Company. The Wedlock 5k run is a unique way to renew your commitment to each other and to running while also benefitting Helpmate, one of my favorite Asheville charities. Helpmate has been advocating, supporting and assisting victims of domestic violence for decades. If romance is intriguing, how about a “trip to Argentina?” Lex 18 Supper Club is offering a 1920’s candlelit dinner, music and tango revue. Relax and enjoy your time away. We’ll take care of your pets just as you would. You will receive email updates to assure you those four legged family members are well cared for in your absence. What are your most difficult “cat problems?” Does you cat poop just outside the litter box? Does your cat launch into attack mode when a guest enters the home? 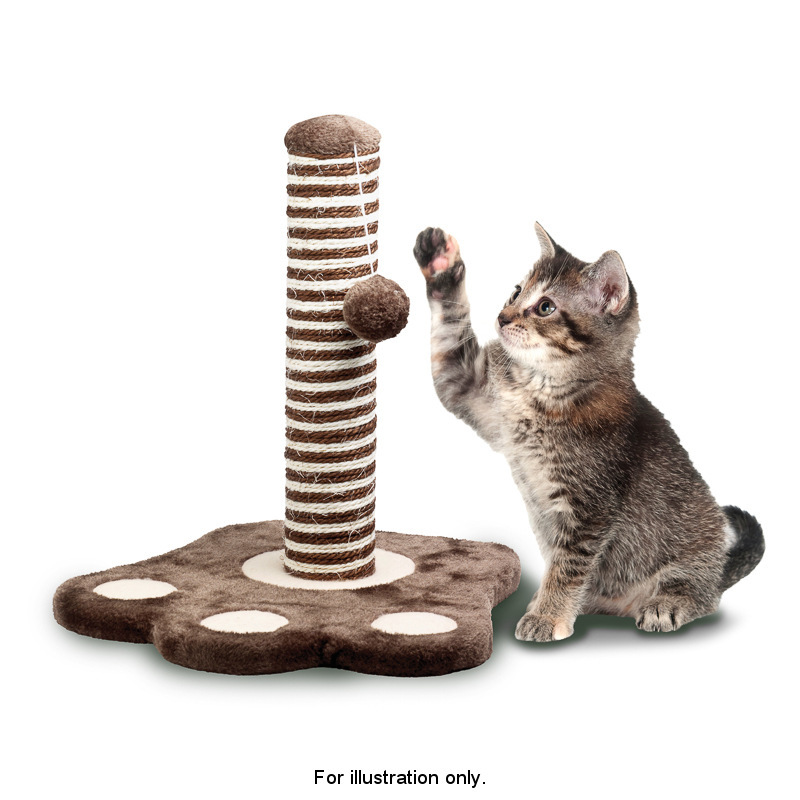 Do you find the look and style of cat trees unattractive? Or maybe you just want to make your home more pleasant for you and your cats. Take a look at Jackson Galaxy’s book Catification. The book is chock full of innovative suggestions. Galaxy is the host of “My Cat From Hell” on Animal Planet. He co authored the book with Kate Benjamin, a cat style expert. The authors discuss the “why” behind cat behaviors and recommend positive methods to work with your cat’s nature, instead of against his nature. We particularly like the superhighway design that Dan and Jenne Johnson, a Wilmington, NC couple, developed after getting the idea from Galaxy’s show. 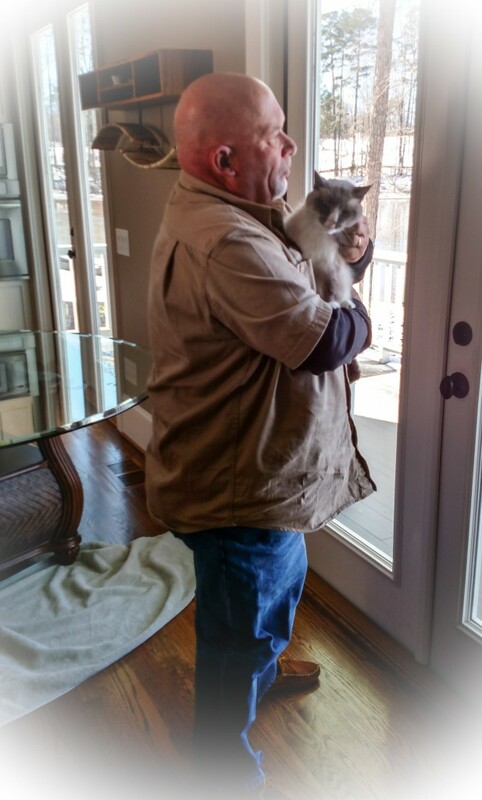 As professional pet sitters we visit a lot of homes with cats. We love to visit homes where the humans have put out cat scratching boxes, cardboard boxes and toys. Most of the ideas in this book could easily be implemented. Have fun! 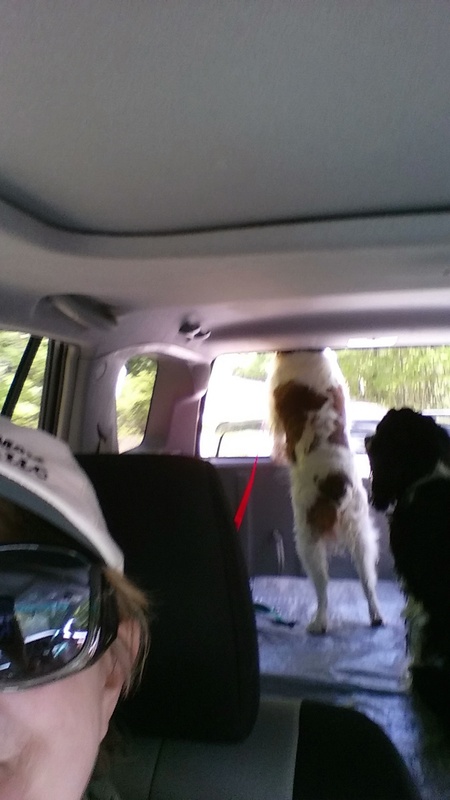 We love our three dogs, two male English Springer Spaniels and a female Brittany. Nothing is more important than keeping them happy, healthy and safe. As professional pet sitters we visit with multiple pets on a daily basis. Their welfare is of great importance to us also. In that spirit we offer these summer safety tips for pets. If your dogs eat kibble (ours eat Taste of the Wild) be sure to store the food in a safe manner. It’s important to retain the bag in case of recalls. If you dog becomes ill you will also want to check the lot number in the unlikely event there was a problem with that batch of dog food. If you dump the dog food into a plastic container without cleaning it between new bags the food can become contaminated and rancid. In summer temperatures that becomes even more likely. That’s why we store the entire bag of dog food inside an airtight plastic container. We close the bag to help keep it fresh and store it in the plastic container in our “dog palace.” Our “dog palace” is an over sized laundry/storage/dog shower/dog crate room that is heated and air conditioned. Luke, Daisy Mae and Trooper enter and exit our house here, eat in this room, get their paws wiped down and chill out when they are dirty. Although the temps are going down, it is still too hot to leave your dog in the car. Even if the top temp is only 78 degrees the temps in a closed car will rise to 90 degrees in five minutes and 110 degrees in 25 minutes. I don’t know about you, but I have never been able to get in and out of any store in five minutes. Even in the shade and with windows cracked it will get waaayyy too hot. 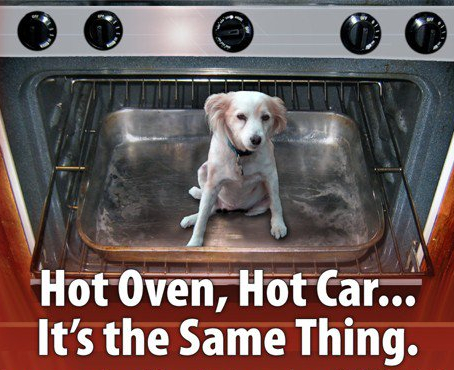 It only takes 15 minutes for an animal to get heat stroke and die in a hot car! Please leave Fido at home to chill out in the AC. If you see a dog (or child) left alone in a car please check with the store manager and if the parent does not return soon, call law enforcement. Teach your children that dogs and cats are living beings with feelings. For safety also let them know to always ask permission before petting a dog or cat. Let your children know they must leave the dog alone when he is in his crate because that is his safe space. Focus on teaching your child to use gentle behavior when interacting with dogs. 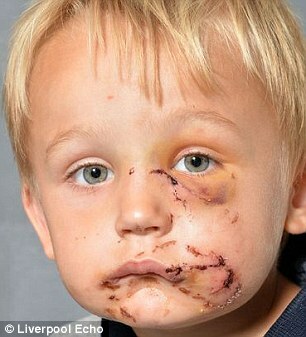 Make sure your children know not to tease a dog by taking his toys or treats. Only by teaching empathy can we assure the safety of our children and our pets. When we fail to teach basic safety and empathy we risk the danger of injured children and euthanized pets. As professional pet sitters, we scoop a LOT of kitty litter. Recently we were introduced to a litter that we can rave over. That’s right..the words printed on the box were actually true. We took care of three cats in a household that share one litter box. We made visits two times a day but were concerned about the potential odor. Not one bit. It was like magic in terms of sealing in the odor and not making a mess outside the box. 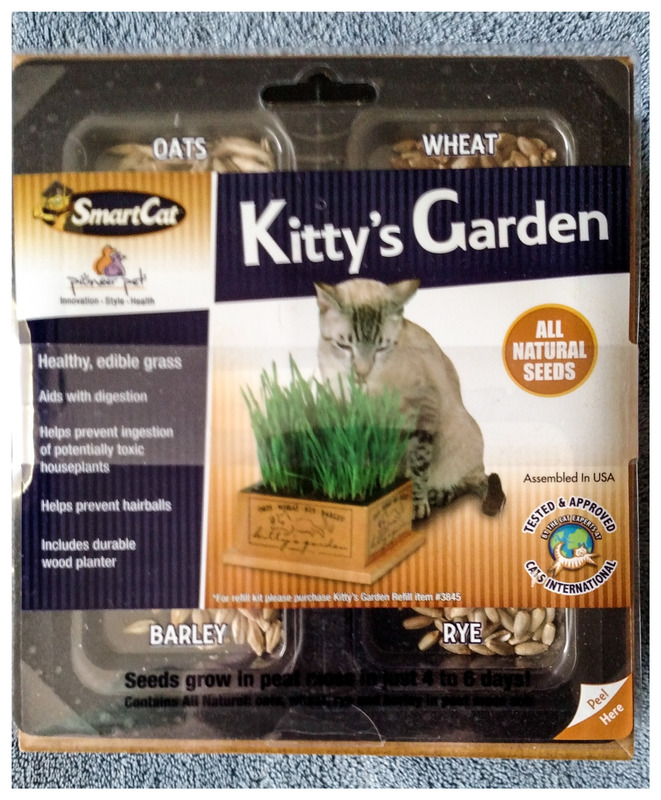 We heartily recommend these products for cats. Another product we were impressed with was the Just for Cats Calming Spray by Nature’s Miracle. 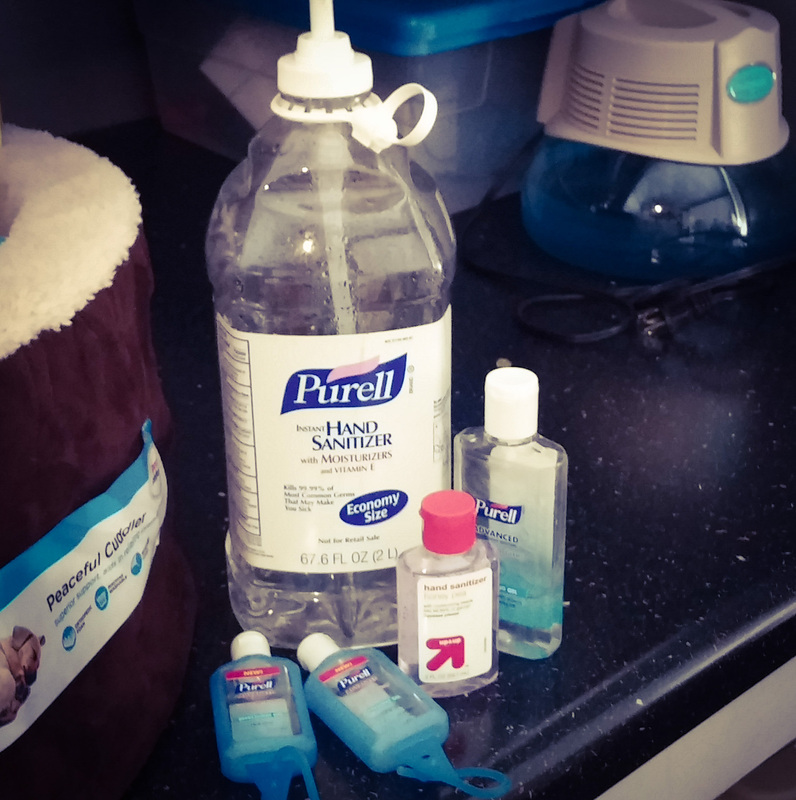 We sprayed this on our shoes and notebooks before entering the home of three cats who had a less than perfect introduction when the newest cat was brought in. We were tasked with keeping one cat in a separate room due to a history of cat fights. 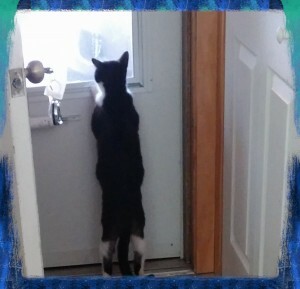 One day that cat managed to get out of her room, but lo and behold there were no fireworks. Disclaimer: We received no compensation for the use of these products or for blogging about them.